We were up at 0730 as the sun was coming up. They have beautiful sunrises here and the heat from the sun feels so good. One feels like curling up in the sunlight like an old cat. This is another nice campground with the Spud and Joan seal of approval. The only fault is the noise from the traffic on the I-20. One has to wonder where everyone is going and the traffic noise is continual all night long. A lot of the 18-wheelers have signs on the back stating they require drivers, their phone number and sometimes a brief description of the job requirements. One wonders about the safety aspect of these large trucks. At one of the truck stops several days ago I noticed that one of the back tires on one of the tractors was as bald as a racing slick. There was not a sign of tread on that tire. It was completely worn out. 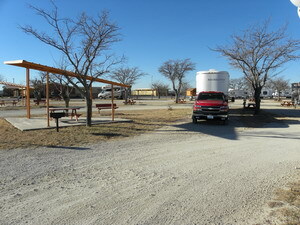 We were in site 18 at the Abilene RV Park and this is a photo of the truck in that site. The main sign for the park at the main gate. 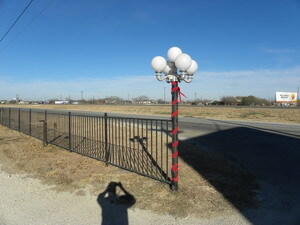 The main gate post decorated for Christmas. It seems rather odd with the temperature in the 70's. 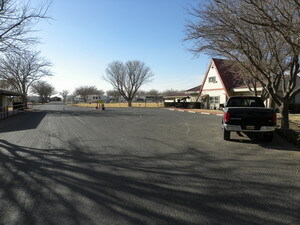 Site 18 was right next to the main gate. The campground with the main office in the background. This is the front row with our truck in site 18 and one can see the I-20 highway on the right. The big motorhome next to us was Tom & Dottie from outside Knoxville, Tennessee. They were down here last year and when Tom got home he found out he had cancer. He was a great guy to chat with and there is always something it seems to scare one. You rather wonder at times when you will be next. We got around and managed to get on the road at 1005. It seems hard for us to get going before 10 AM. We must be old and slow I reckon. It was 63F when we left and it crept up to 78F. 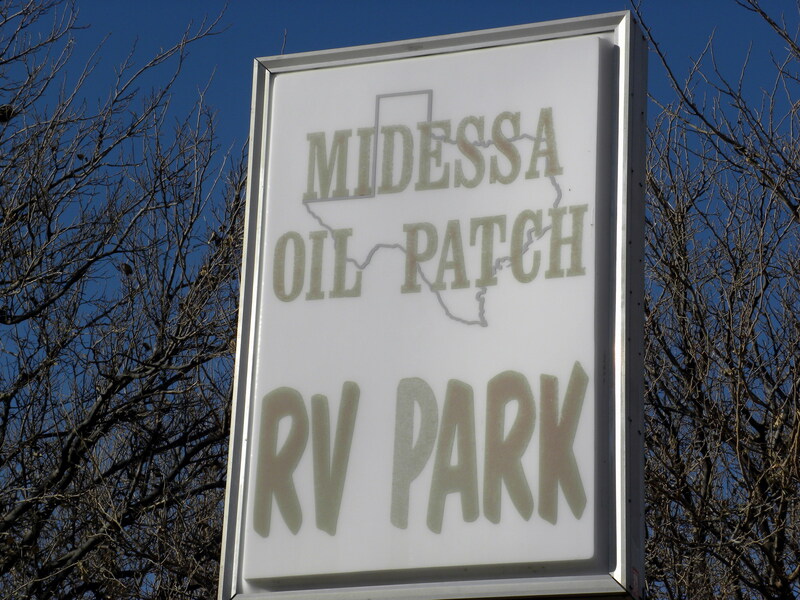 We pulled into Odessa, Texas, at 1 PM or 1300 for fuel and went 3 miles down the road to the Midessa Oil Patch RV Park and called it a day. Not much of a day at 277 kilometres but it had Joan's seal of approval and that is all that counts. In other words don't rile up the navigator. We have passed a number of ranch gates the past few days and have seen cowboys on horses working cattle the once only. We saw a few Texas Longhorn Cattle. I did not realize there were any left. They must be for show only. Most of the cattle are Black Angus beef cattle. We went past Roscoe, Texas and one wonders what limb of the family tree the one who created that name hangs on. Then we realized Roscoe is either in Mitchell County or close to it. One thing for certain Mitch, them thar Texans know good names when they see them. 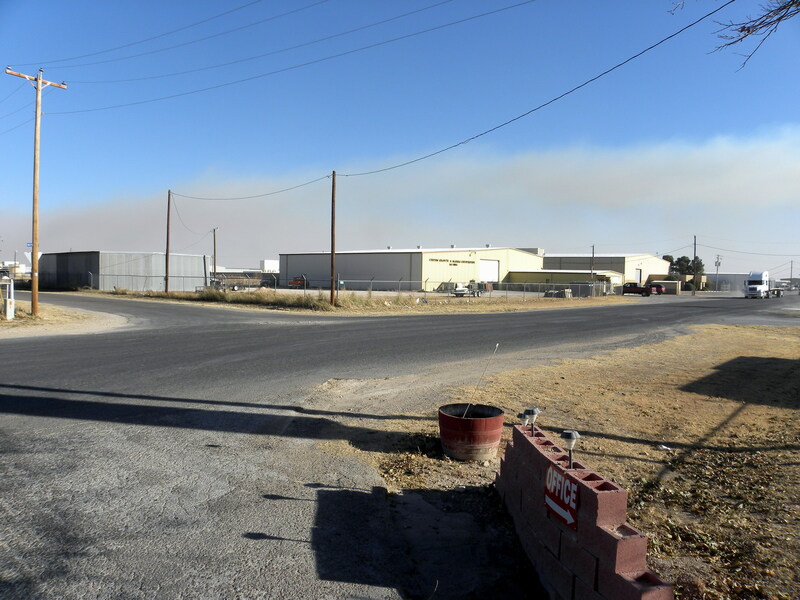 The town of Roscoe was not much. 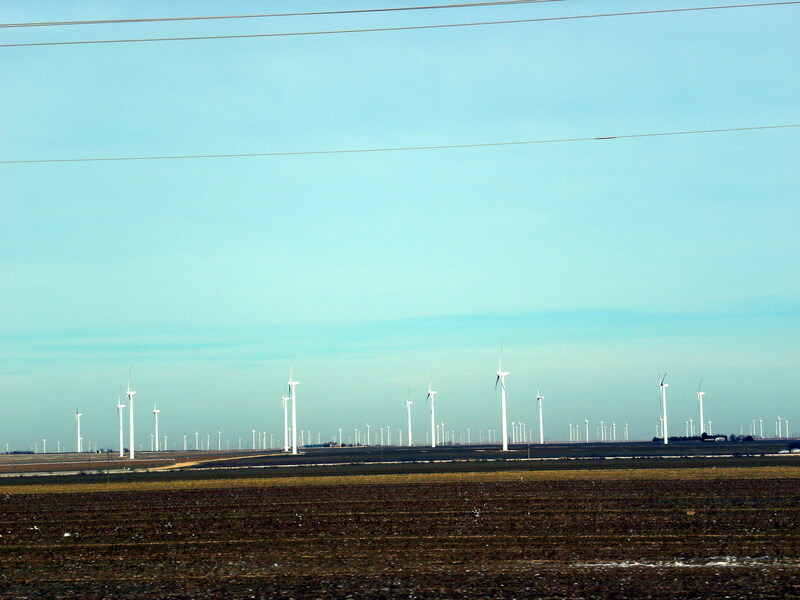 There were a few old run down homes close to the I-20 and acres and acres of electric generating windmills. That probably should read miles and miles. We did not realize the town was the old run down homes or we would have tried harder to get a photo of them. We is in the deep south ya'all. We kept the speed down today at around 55 or 60 miles per hour. We drove the old girl quite hard yesterday and the little engine light came on. This is the second time that has happened this trip. Once you take it a bit cool it goes out so it must be something simple and something temporary. But we is definitely in the south. One long 18-wheeler went rolling past us today and the mud flaps on his trailer read “Only Jesus Saves”. That is definitely the south and one is forever passing a baptist church of some description. We had a beautiful drive today and everyone behaved themselves well on the I-20. There was some road work as they call it and we had to take a slight detour off for the road work once. 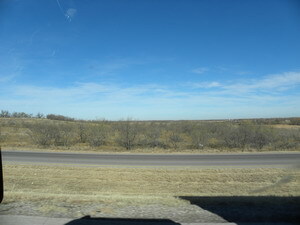 The sky was clear blue with the exception of some very high wispy cirrus off to the north. The wind blows continually and it was a head wind for us today. 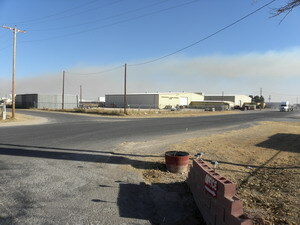 The wind produces a reddish haze I guess one could call it from the dust in the air. When one pulls into a campground their vehicle tires are coated in the dust. The old round thermometer I purchased at a sale in Sambro and Mitch and I mounted here in the trailer read and reads 82F. We have all the windows and all the vents open. The old boy that guided us into our site said he does not start to function until the temperature hits 80. He said these trees are male Texas Mulberry trees. 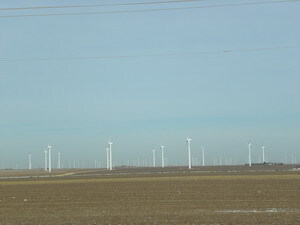 The trees we have seen along the highway must be the same. They look the same. No doubt there are a few female trees among them. It would be rather boring for the male trees if there weren't. 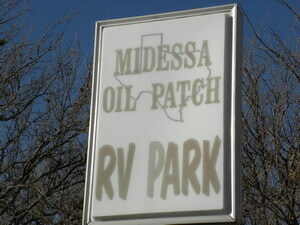 This is the Midessa RV Park sign and it is rather hard to tell that isn't it? 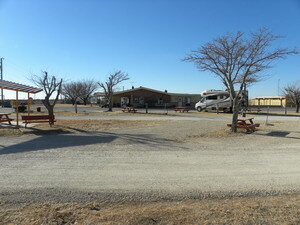 This is the Midessa RV Park Main Office. Yes, we are in Texas no doubt about it. 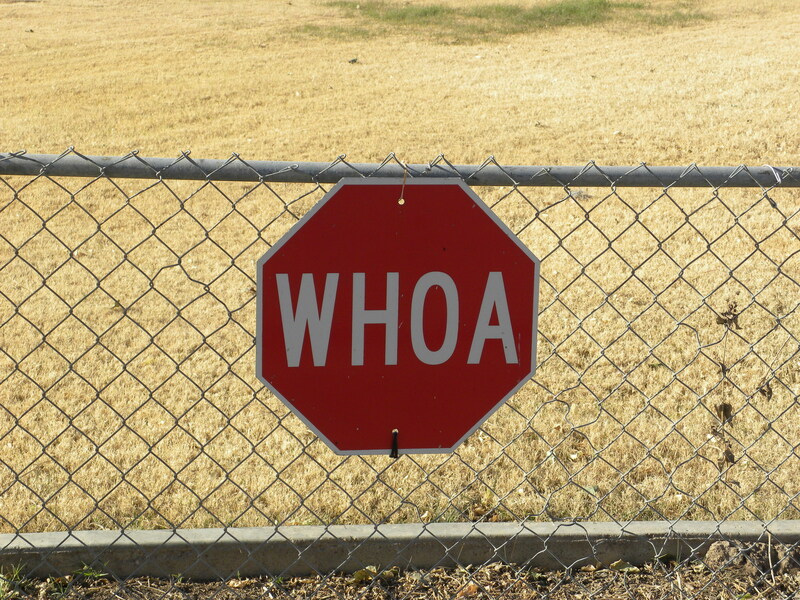 Would Texans be bilingual in both English and Horse? 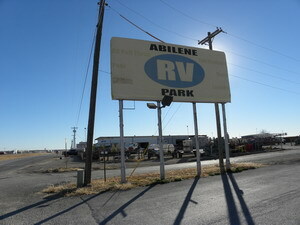 We were assigned site 18 at Abilene and believe it or not we are assigned site 18 here at Odessa. 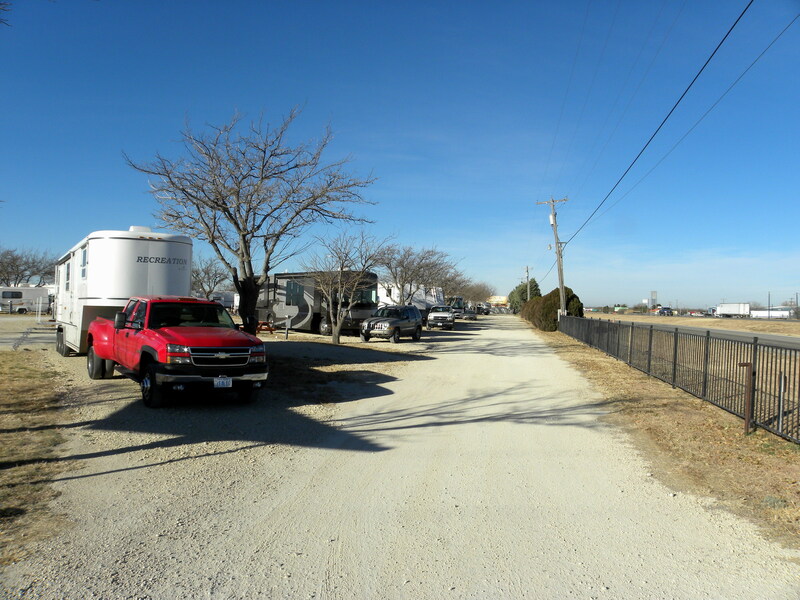 This is the truck down on the right in site 18. There will be no amateur or ham radio here. That dang male mulberry tree is right in the way. Besides the wind is so strong we had to bring in the rail on the patio it was rattling so. The HF antenna would do the same. 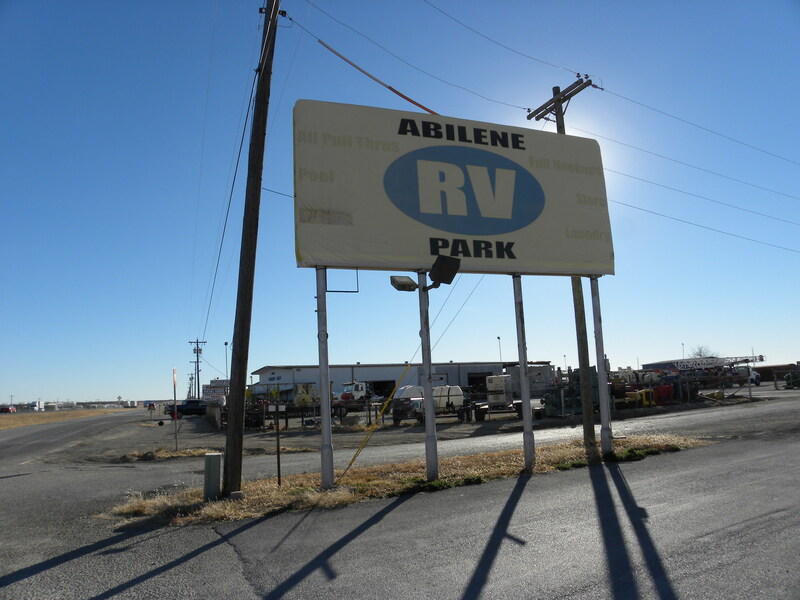 This camp site may be a bit noisy but not as noisy as Abilene. One can hear a train and some trucks. A couple of aircraft have gone over fairly low so the airport must be handy but so far so good. 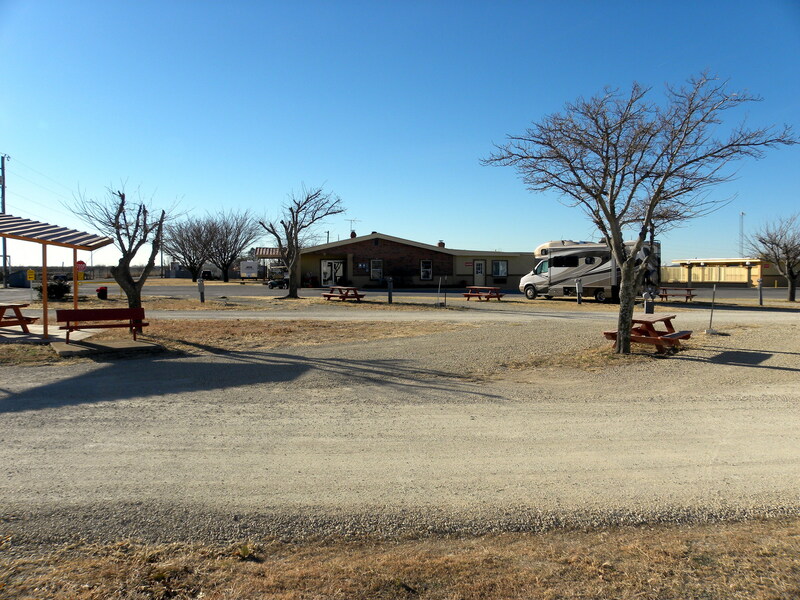 It seems like a great place to camp and will likely receive the Spud and Joan seal of approval along with so many other Good Sam parks we have camped in. Joan goes for a computer connection and then Good Sam when she looks for a place to stop. There are a lot of rigs in here and according to the literature they gave us there are 133 when full. It is fairly full and we feel most are oil rig workers. 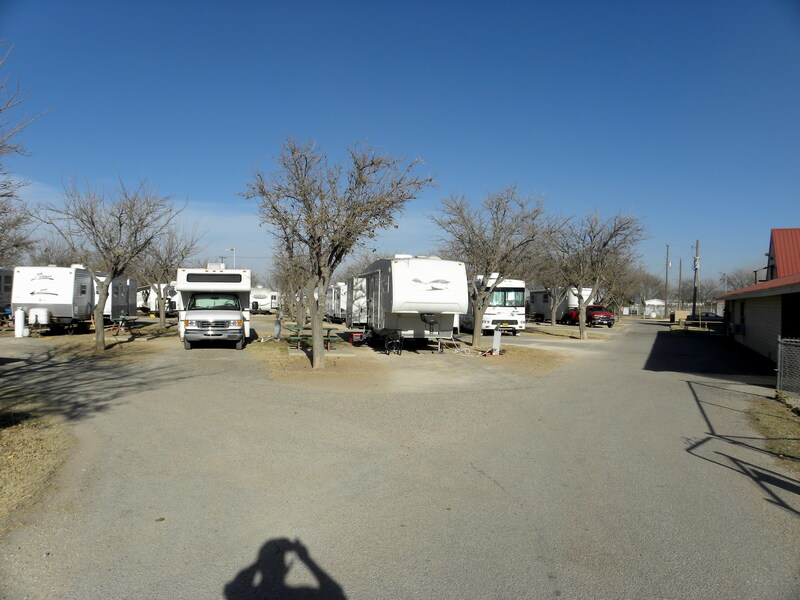 Their rigs, campers or whatever and vehicles would indicate that.